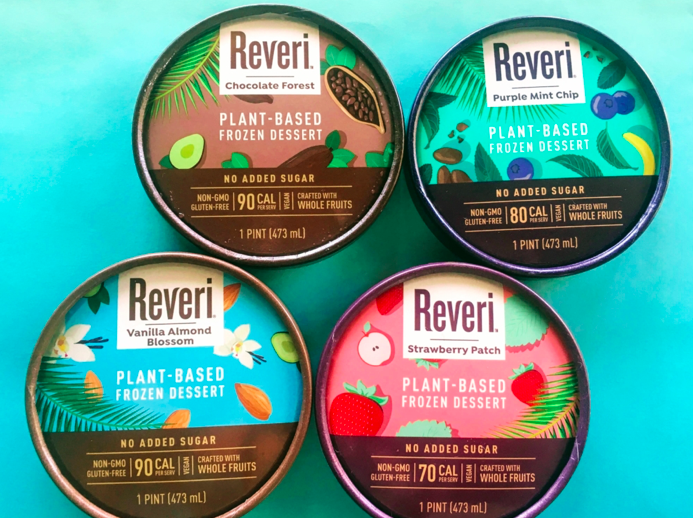 If you love the taste of ice cream and want to add another plant-based alternative, Reveri has two creamy new flavors: Purple Mint Chip and Vanilla Almond Blossom. Our tasters were quite pleased with the texture and creaminess of Reveri, which they highly recommend, even if you aren’t avoiding dairy. everi‘s Purple Mint Chip is a twist on classic mint chip ice cream, and is a blend of blueberries, nutritious seeds, organic cocoa nibs, and peppermint. Their Vanilla Almond Blossom is rich and delicious, combining a mixture of almonds, almond butter, and creamy rich vanilla. Reveri also has flavors such as Chocolate Forest and Strawberry Patch. Each ranges from 70 calories to 90 calories per serving. Reveri is located in 12 stores in the Southern California area. You can also find it on online here. Reveri is a game-changing alternative to ice cream that ends the trade-off between luscious taste and health. Reveri is crafted from whole fruits and vegetables. Reveri delivers the sweet taste and rich mouthfeel of super-premium ice cream, yet contains no dairy, added sugar, sweeteners, or fats, and averages only 82 calories for a 4-ounce serving. It is also gluten- and GMO-free.